#ShahRukhKhan took to Twitter to share the news Eid trailer of his upcoming film, #Zero. The actor tweeted, "Yeh lo..yeh lo @aanandlrai ki taraf se...Iss baar Eid Ka Meetha bahut Tez hai. To everyone from me and the whole team of Zero...Eid Mubarak. Love u all & hope u like it. #ZeroCelebratesEid"
The special Eid teaser shows, Shah Rukh in his Zero avatar entering a ring to a Javed Jaffery's voice over to a dance completion. He is followed by Salman Khan who gives him the confidence to dance on the stage. Then the two are seen dancing together on a song. Bollywood has been reacting to the release of the song, Emraan Hashmi took to twitter and said, "Dono bhaiiyo ne Eid special bana di... Super stuff @iamsrk and @beingsalmankhan !! 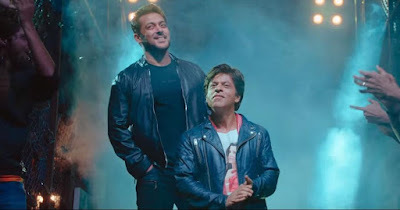 #ZeroCelebratesEid"
Sonu Sood who has worked with Salman Khan in action films tweeted, "Dono bhaiiyo ne Eid special bana di... Super stuff @iamsrk and @beingsalmankhan !! #ZeroCelebratesEid"
The film stars Shah Rukh Khan, Anushka Sharma, and Katrina Kaif in pivotal roles while it will also have many cameos including Sri Devi's last appearance. Directed by Anand L Rai, 'Zero' starts, Shah Rukh Khan. Anushka Sharma and Katrina Kaif. The film is a collaboration between Anand L Rai and Red Chillies Entertainment.